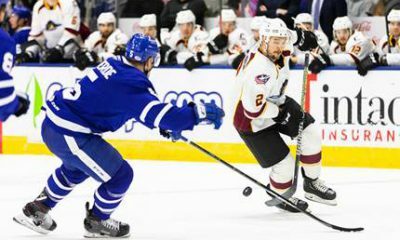 The Cleveland Monsters were defeated by the Rochester Americans on Friday night at Blue Cross Arena in the first edition of the ‘Great Lakes Rivalry Series’ by a final score of 3-1. With the loss, the Monsters drop to 13-10-3-0 overall this season and with 29 points, currently sit alone in fourth place in the AHL’s North Division standings. After a scoreless first period it was Rochester who struck first, getting an even-strength tally from Alexander Nylander at 2:29 of the middle frame to give the Amerks a 1-0 lead. In the third period, Rochester increased their lead to 2-0 when Brandon Hickey netted a five-on-five marker at 17:09, before Danny O’Regan potted home an empty-net score at 17:33 to give the home team a 3-0 advantage. The Monsters capped the scoring moments later by netting their first goal of the night at 18:49 courtesy of a power-play goal from Adam Clendening on feeds from Nathan Gerbe and Sonny Milano, securing a 3-1 home win for the Amerks. 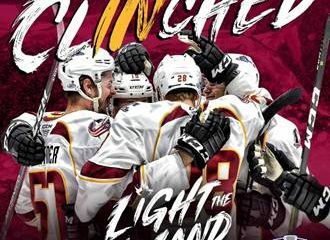 Monsters goaltender Jean-Francois Berube stopped 23 of the 25 shots he faced to drop to 9-8-2 on the season, while Rochester backstop Scott Wedgewood stopped 42 of the 43 pucks he faced to improve to 8-4-1 on the year. Next up for the Monsters, it’s a Saturday home rematch versus the Amerks with full coverage, live from The Q, underway at 7:00 pm.